The course aimed to teach participants how to plan and implement online learning, including how to decide what to put online, what tools to use, how to communicate with students and how to gather feedback. “We have had some great success with our online courses but wanted to upskill more staff so that we all have a clear idea of where to start when it comes to putting our training online,” said Sharon Lawrence, Educator at the Institute. The course was delivered as a massive open online course (MOOC) through the University of New South Wales and took 6 months to complete. The MOOC format meant that Sharon and the other Institute Educators were among thousands of other students from around the world doing the course. “As part of the assessment, we had to give feedback to two other randomly selected students, which opened us up to a range of different perspectives,” Sharon said. 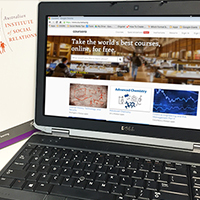 Building on our understanding of online learning best practices, the Institute is looking to offer several courses online in the future. Watch this space!